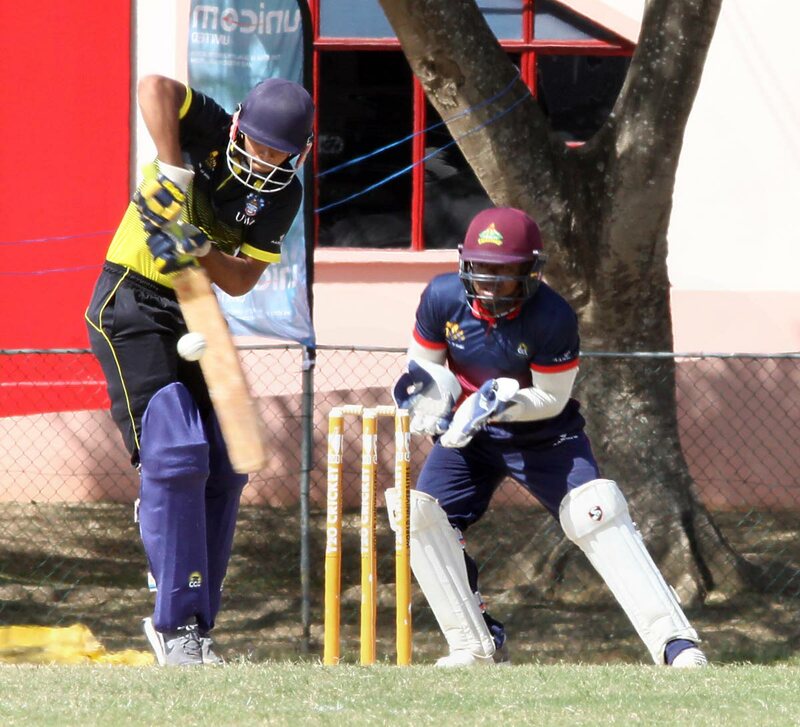 COMBINED Campuses and Colleges (CCC) hammered UWI by seven wickets to finish atop the preliminary standings in the UWI World Universities T20 Cricket Tournament yesterday, at the Sir Frank Worrell Cricket Ground, St Augustine. UWI were sent in to bat and made a scanty 105 in 18.5 overs, with CCC then racing to 106 for three in 13.4 overs. CCC finished with three wins and a loss and will play in the first semifinal today from 2 pm at the same venue. However, their opponent was unknown up to press time as England's Oxford and USA were due to contest the evening game yesterday to determine the top four in the five-team round robin. UWI and Tertiary Sport Association of TT (TSATT) ended their round robin on two wins and two losses. Keron Cottoy (four for 12 from his allotted four overs) and Jarlanie Seales (three for 13 from three) did the damage for CCC. Seales got Adrian Ali (20), Sachin Seecharan (15) and Daniel Williams (four) all edging behind to wicketkeeper Gian Benjamin. Cottoy got in on the act by bowling Steven Katwaroo, getting Michael Frew stumped by Benjamin, scalping Cameron Pennyfeather LBW and immediately bowling Rachad Forde – with all of them failing to get into double figures. Duane Cockburn (24) and Shaquille Brown (12) offered resistance to get UWI over the 100-mark, but Yannick Ottley (two for 20) would help mop the innings up. CCC wobbled early in their chase and were reduced to eight for two, losing Kyle Corbin (one) and Leonardo Friginette (duck). Opener Kjorn Ottley blasted five fours to get to 20 before Brown scalped him with the score at 25. However, Yannick came to the wicket with Odain McCathy to get the job done. Yannick finished unbeaten on 46 from 41 with seven fours, while McCathy cracked 34 from 24 with one four and one six, in a victorious partnership of 81. The victor of today's eliminator between CCC and the second-placed team will go into Sunday's final, while the loser will face the winner of the match between the third and fourth-placed team to make it to the finale as well. On Tuesday night, USA ignited hopes of edging Oxford for the final spot by beating TSATT by six wickets. Opting to bat, TSATT got 142 for five thanks to Randy Mahase's enterprising knock of 67 from 60 balls (seven fours, one six) and Mark Deyal's 23 from 18. Kyle Phillip took two for 20 for the visitors, setting up USA for a surprisingly comfortable chase. They registered their first win by getting to 144 for four from 18.1 overs, with man-of-the-match Sagar Patel making 40 from 43. Derick Narine (35 from 24), Abhijai Mansingh (33 from 23) and Kishan Das (22 not out from 15) helped guide USA home in impressive fashion. Reply to "CCC top World Universities T20 table"